Today's theme comes thanks to the lovely Thiamere who chose 'Girly' as her theme. 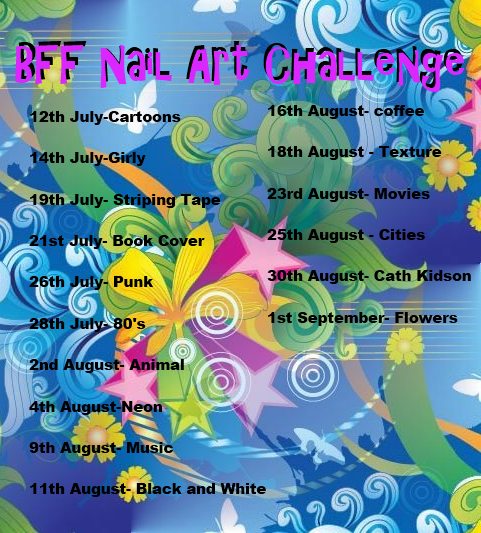 As you know I am not the most girly of women so I found this a bit of a challenge. For this manicure I decided to use one of my untried polishes. 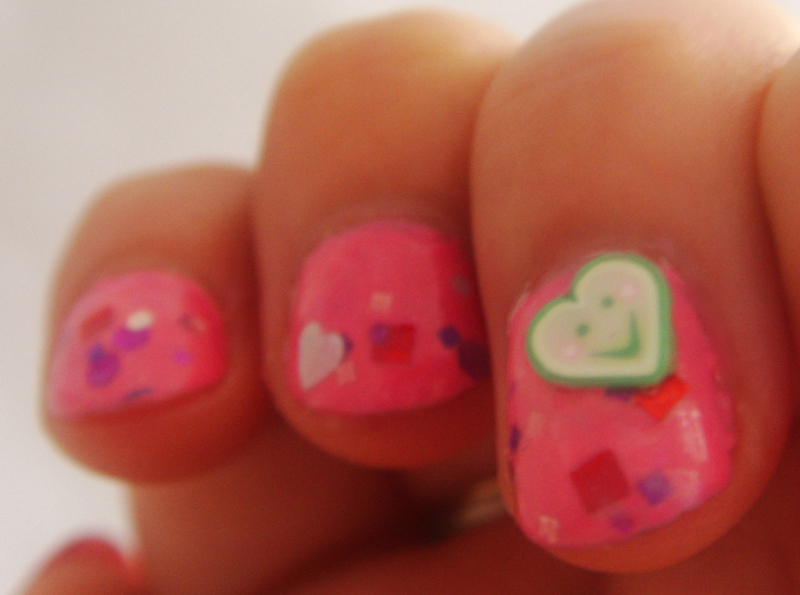 Lynnderella Matter of the Heart, which is a creamy pink polish with red. silver and pink hex's and red square glitter and silver hearts. However this polish is very sheer and to avoid using half the bottle (these are like gold dust now) I used a base of Barry M Bright Pink, which is actually a baby pink! Using MOFT over the Barry M toned down the colour, creating a milky tone that I really liked. Sadly even with fishing in this polish I only managed to grab one heart which you can see on my middle finger. Because I couldn't fish out any more hearts I decide to use a cute filmo slice on my accent nail. Isn't he cute? I actually really like this combination. Shock horror! Although it is a bit sickly sweet to wear all the time! Do you have a certain style to your manicure? What do you think of pink polish? Don't forget to check out the others ladies girly manicures! And stay tuned for my girly manicure this Saturday! aww this could NOT be more girly!!! love! awww...so adorable even with nubbins! i haven't had any lynns & i dont think ill ever will..haha! This is SO cute and VERY girly! I love it!